When it comes to doors, you want something that will open up space with an aesthetic appeal to complement any home and room. Doors are an important feature and finishing touch, so a considered decision is needed. With bifolding doors you have class and a modern appeal that can’t be matched by the traditional patio or French designs. Whilst they’re often seen with two panels, there can be more, connected by centralised hinges for ease of operation. Bifolding door panels are pushed together before being folded to one side, making the most out of space available. 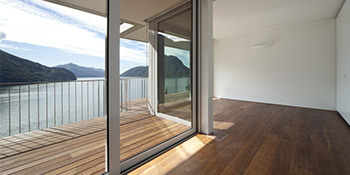 Bifolding doors create a fantastic room divider and because of their ease of operation combined with aesthetic appeal, they’re surging in popularity. The design of bifolding doors is specifically for ease of operation. They fold back to allow extra space in your home and are especially useful for when space is limited. They work extremely well as a replacement for patio or French doors, bringing the outside in. The modern aesthetic appeal that bifolding doors provide makes them perfect for orangeries and conservatories, linking the home and garden. By opening up space as opposed to patio doors, you can bring the outside in and add something different to your home. For those thinking bifolding doors look great but wouldn’t provide necessary protection for the property, you couldn’t be further from the truth. With internal beading the glass can’t be ‘popped’ by intruders and with the latest designs such as the multipoint locking mechanism, you’ll have a fully secure application. With plenty of styles and designs on offer in the bifolding door range, there’s something for everyone. There are many colours and patterns available for you to choose from and attractive looks include the louvered, raised-panel and French ranges. Bifolding doors instantly improve your home’s appeal and allow you to choose a style that suits you and your property. By integrating the latest security measures you’ll ensure your home is well protected too. For up to four FREE quotes from local, vetted and reputable contractors in your area, just complete our quick form and hear from the professionals. The below information displays the energy performance of houses in Uk. Energy ratings range from A to G, with A being the most energy-efficient and G being the very least efficient. The Energy Performance Certificate (EPC) rating comes into play heavily when trying to sell your property, as potential buyers will see just how much they're probably going to be spending on their home heating expenses. House upgrades such as insulation assist to substantially improve a home's EPC rating. The data below shows the diverse types of houses within Uk. By far the most common properties across the UK are detached and semi-detached properties. Various other households consist of terraced houses, flats, converted flats and bungalows. The pie chart underneath indicates the proportion of houses within Uk which are central heated and non-central heated. Central heating figures within the majority of UK houses, including those on the gas grid and homes heated by oil and electric. The information beneath shows the spread of households heated by various fuels. Around the UK the most frequent by far and away are gas heated homes, followed by electricity and then oil. Biomass boilers are also increasing in popularity, heated by environmentally friendly products like wood pellets or agricultural waste.|Properties in the UK are heated up by a variety of fuels, which include gas, electricity, oil, solid fuel and LPG boilers. Each fuel has a varying cost associated with it which means you may find yourself with less expensive energy bills by changing how your household is heated. Even solar thermal panels are being regarded as by many people in order to lower heating bills for the years to come.